Like music [which is nearly always playing in my home] wine too, whispers its secrets, but you have to slow down long enough to hear what it's saying, and if the wine has a song to sing, in my opinion, Saint Emilion is its composer. Since returning from my trip to Bordeaux, I had become smitten with its flavors and finesse. The wines of Bordeaux, in general, offer so many different expressions, and it would seem to me that those impressions are timeless, but I also found them to be evolving. In my opinion, until you take the time to slow down, taste its textures, flavors, and breathe in its aromas, you may have a hard time understanding what it is, I'm attempting to communicate here. On my wine journey [if you will] early on, when I became exposed to wine, I was no way ready for Bordeaux, I needed easier to understand wines, which required little thought or contemplation. In fact, I often thought, "sheesh, what is all the fuss about anyway?". I just didn't get it, and I frankly didn't want to "get it" back in the day, when I had just started to collect bottles from my many different travels. But now, you'd be hard pressed to drag me away from a Bordeaux tasting, or any opportunity to make a few discoveries from this vast region. Once the scales fell from my 'eyes', I became like the proverbial kid in the candy-store, there are so many new wines and producers to discover, and the older, more mature bottles, well, all the better in most cases. Saint Emilion has caught my attention, to the astonishing surprise of both Mrs. Cuvee and I, who had figured ourselves for more of a left-bank leaning inclination but have found the opposite to be true. "A great wine is not the work of one man, it is the result of a tradition that is upheld and refined," wrote Paul Claudel. The first wine in the night's lineup was the 1995 Chateau Troplong Mondot, Grand Cru Classe, St Emilion, a relative new comer in St Emilion, nonetheless sporting those famous flavors, aromas and the ability to produce long 'lived' wines of substance and soul. With Merlot leading the way, and Cabernet Franc and Cab-Suav filling out the back end of this elegant wine, enthusiastic flavors and aromas of the go-go nineties were in abundance. In the glass, as you see above, sporting brick colors and a modest amount of sediment. The aromas escaping from the glass, reminded me of a backcountry trail, on a warm summer day in San Diego, the kind of day where aromas of wild licorices warmed by the summer's heat perfumed the air. The tannins had completely mellowed, the structure still intact, but this wine is in its prime drinking window, sporting lean flavors of cherry, dark plum, vanilla and other spices, the finish sails on and on. Drink now or forever hold your peace. My score 91 points. The second wine in the line-up was the 2000 Chateau Quinault L'Enclos, Saint-Emilion Grand Cru. While it has been under new management since 1997, putting their winemaking skills as their priority, and hit the ground running, positioning themselves in the right place and at the right time to take advantage of the outstanding millennial vintage. A delicious Merlot [70%] dominated blend, 15% Cabernet Franc, 10% Cabernet Franc, and filling in the cracks with Bordeaux's prodigal son Malbec. I was hard press to get beyond the funk in the nose, a wet, woodsy barnyard like aromas, which eventually blew off later, revealing leather, licorice, and dried figs. After a few delightful sips, slurps and a slyly erupting burp [gasp], a basket of delight erupted, spilling cassis, black cherries, dark plums, a meatiness, and a savory balsamic note. Well, integrated tannins danced to the merry tunes, while the structure left no doubt, this wine has a few more years left in it. My score for this gem 92 points. The third wine in this incredible lineup of classic right-bank producers come from the centuries old [ boasting of a history going back to the times of Roman occupation] Chateau Figeac, Premier Grand Cru Classe 2005 St. Emilion, whose property butts up against the famed Cheval Blanc. A much richer, rounder and far more approachable wine than the two above, but a bit disappointing because it was not the classic Bordeaux style, I was expecting. That said, I would not kick it out of bed, anytime soon and it'd be welcome in my cellar anytime. Nonetheless, an amazing wine of great depth and complexity, a real stunner sporting new world flair. In the glass, the wine is nearly opaque, a brooding beast begging for more time to round out its immature structure, a bit more oak nuances than I had anticipated from this classic producer. This wine is going to be great, but I don't think it's ready for prime time yet, I'd give it a few more years, thinking 2016 would be a good time to circle back to this wine. My score, in this moment, is 90 points and I do recommend it highly if you like extracted Napa Valley style in a bottle of Bordeaux in the short term. If you decide to drink this wine early, an hour or two of decanting would be advised. The fourth wine in the lineup comes from the Chateau La Confession, St Emilion, 2005 Grand Cru. Like the Figeac above, this wine has even more modern sensibilities. One whiff of the nose and you immediately know this wine has an evolved style, speaking New World finesse and pageantry. If this wine had been produced by a swanky Napa winemaker, the price tag would be than double or even triple Benjamin territory easily and allocated like tickets to an exorbitant Obama Fund Raiser dinner. On the palate, pure drink now and drink often drinking pleasure is to be easily had. It's loaded with red and dark fruits, enough acid to carry the day and the structure to last many years in the bottle. The mid-palate had some bear-threads, but over all this wine is very generous, the finish is long and lasting. You want this in your cellar, age it gracefully and you'll be rewarded for your patience. In this blend, Merlot has a less dominate role at 48%, while Cabernet Franc has a fun drum-solo knocking down 48% while Petit Verdot plays bass in the background with 3% rounds out the blend. My score for this wine that sells anywhere from $70 to $115 USD, is 92 points. Some important and very good facts to know and understand the distinctions: there are four key differences between the production restrictions for Saint-Emilion wines, and those for Saint-Emilion Grand Cru wines. Read more here. By the way, the grapes you see in the picture above are actual Merlot grapes I shot on location in Saint-Emilion; taken while I was with a group of other wine bloggers as guests of the CIVB, vintage 2013. The fifth wine in the lineup is a real gem from a relatively unknown property, known as Chateau Rouget whose more straight forward blend of 85% Merlot and 15% Cabernet Franc really wowed everyone at the tasting, a bright and shining star, which in my notes received two gold stars. The nose is immediately captivating, selling itself like a summer blockbuster trailer with heady dark and red fruits, licorice and an enticing funkiness which you just can't look away from. The color is far more garnet, the structure is quite complex and layered. Blackberries, dark plum, leather, floral notes, licorice, baked blueberries and a rich earthiness. My score for this wine is 93 points, I'd definitely tuck away a few of these gems, and drink sooner rather than later, it's showing very well at the moment and I think a couple more years would add a nice level of maturity. 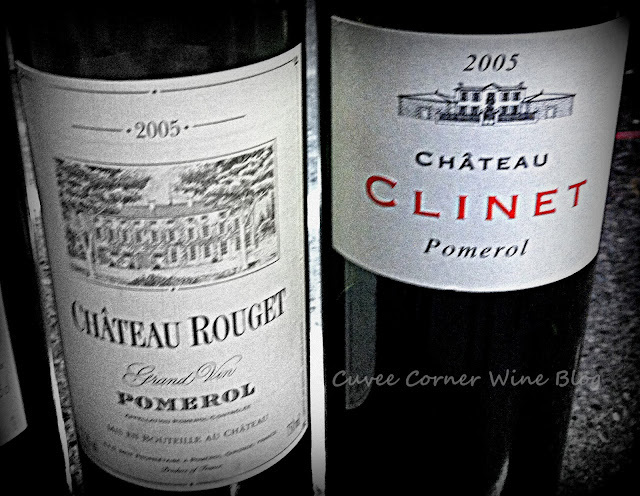 The last wine in the lineup comes from the renown horse-powered Chateau Clinet, we uncorked their brilliant 2005 that really wowed everyone, including me. If you have the coin, I'd buy a case or two of this classic example of right-bank perfection. A real stunner with enough complexity to go the long haul, talking 20 years of drinking pleasure. This wine will continue to evolve and get better, though it's just now hitting its desirable drinking window, I'd hold off opening it for a few more years, don't doubt me, your patience will be rewarded if you do. The first note I wrote, was a single word, 'balanced'. Folks, honestly, this is how you do, a wine tasting, to showcase classic Bordeaux style and substance. It's elegant, the tannins are taught, the structure is huge, and it paints with vivid strokes dark plums, new leather, dry, cracked earth, dark cherries, blackberries and the finish just sails on into the horizon. My score 95 points and in my notes, I made three gold stars next to its name. The average retail price for this gem is $125 but it can be found on auction sites for $90. These wines in the reviews above are just a small slice of the wine drinking joy to be found in the Right Bank wines of Bordeaux and while many of the grand crus sport a somewhat hefty price tag, there's much wine drinking joy to be found in their second labels. If you've still not availed yourself of the opportunity to experience the wines of Bordeaux, then you owe it to yourself to see what the 'fuss' is all about. If you do, I think you too will become captivated by these great wines. Until then folks, as always remember life is short, so sip long and prosper cheers! Great article Bill. My husband and I had a lovely Right Bank Bordeaux from Saint Emilion recently. It was heavenly. I am really enjoying my summer of French wines! Thank you for continue to teach me. Cheers! Well written piece, thank you. Love right bank Bordeaux! Thanks for the kind words, much appreciated. A summer of French wines, I love the sound of that and kudos to you, on your personal pursuit of wine exploration. Thanks, my love and fascination for the wines of Bordeaux, makes writing so much easier. So good to hear from you, I hope all is well and thanks for reading this impassioned post. Thanks for the kind words, surprised to hear my reviews are on anyone's radar at all, but I'm grateful for readers like you cheers! Love the picture of the grape cluster..is that natural yeast that I see on one of the grapes? A very "lively" shot, telling the story of their destiny. (Can you tell I liked the photo?!) Oh....and nice article...very passionate! Thanks, a fun picture, but one that spells trouble for growers. What you see on the grape, is an unfriendly sight called botrytis [aka. fungus among us}. I'm glad to hear you liked the article as well ha! This happens when the conditions, get humid, there is lack of air flow and a lot more rain than is desired in September. The 2013 harvest in Bordeaux was not ideal, on any level; rain, humidity and even worse hail came together to destroy a good amount of the over all vintage. Which means, there's going to be a lot less wine from BDX overall.